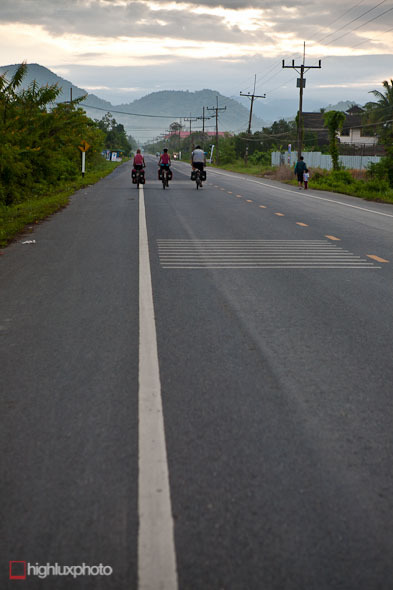 Day 177: Krabi to Trang, 132km. Rolling on Highway 4. 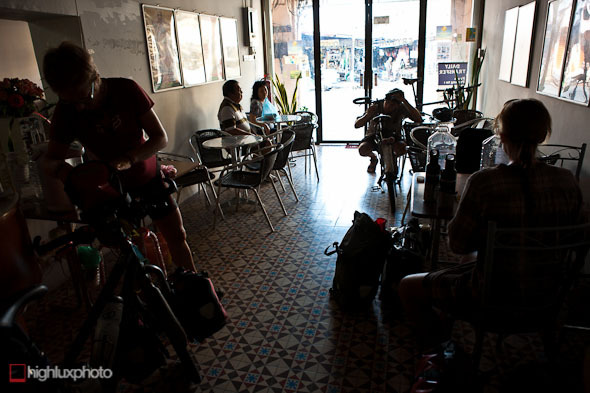 Day 178: Trang to Ban Chalung, 149km. Mix of highway and quieter detours where possible. Day 179: Ban Chalung to Pantai Cenang (Langkawi, Malaysia), 109km. Quiet road to little used border crossing, then busier roads to ferry crossing and across Langkawi. 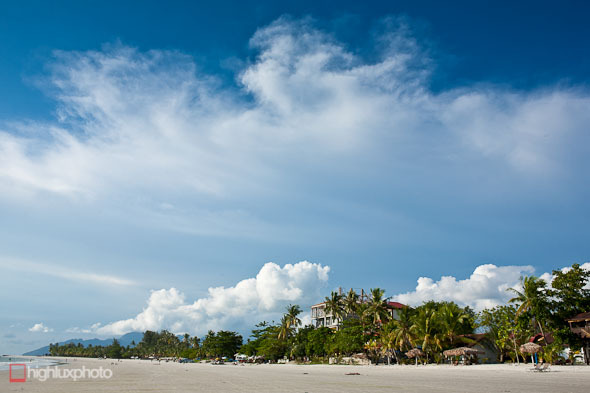 Days 180 and 181: Rest days on Langkawi. 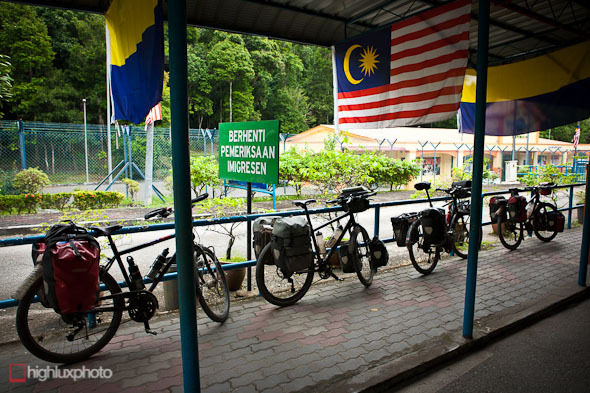 Day 182: Pantai Cenang to Alor Star, 77km. 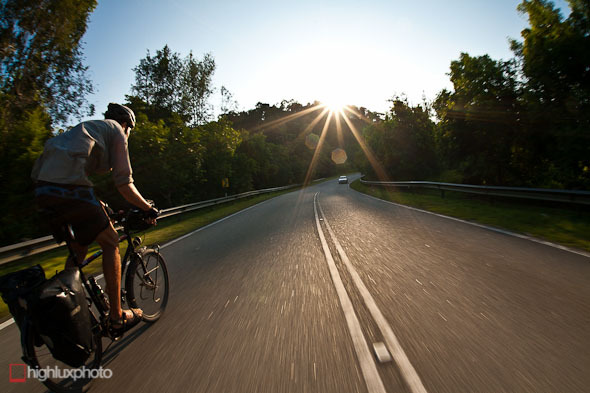 Flat riding on Highway 7. 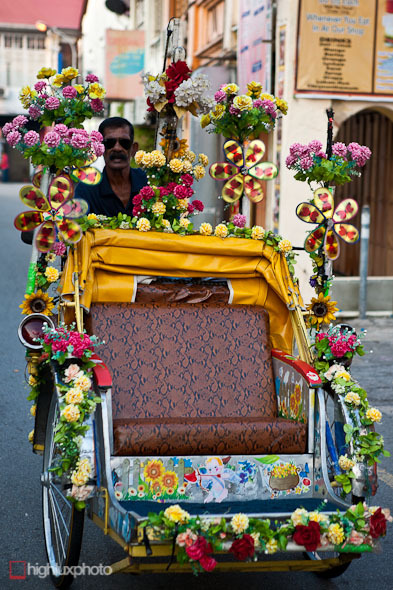 Day 183: Alor Star to Georgetown (Penang), 116km. K1 along the coast, then Highway 1 into Butterworth. Day 184: Rest day in Georgetown. 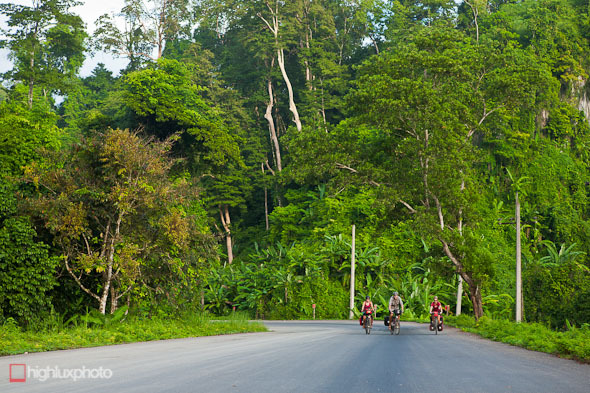 After a few days laxing it out at Railay it was time to hit the road again and make tracks south. While the riding itself didn’t look particularly inspiring on paper, we had great company in the form of UK to NZ riders Ryan and Rebecca and there were some good sights to see. Besides, after only two more days in Thailand we’d be crossing into Malaysia! Country number six since starting out in Chengdu back in April. Kicking off from Krabi after four days off the bikes. 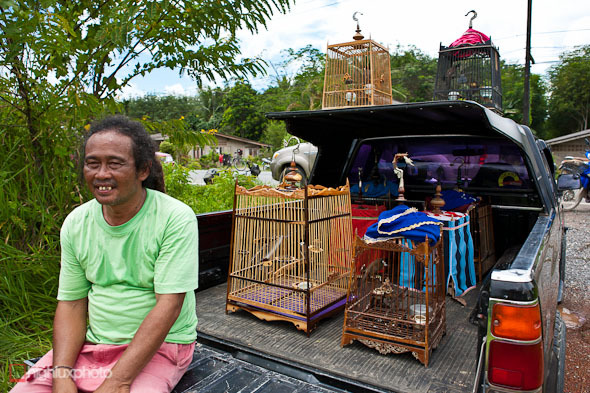 Several times that morning we saw men riding motorbikes while holding a bird cage precariously with one arm. 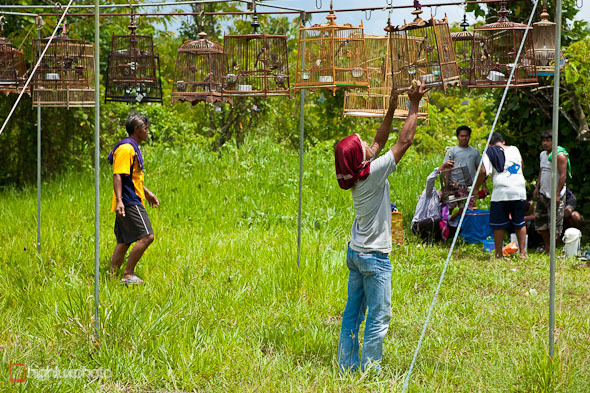 Turns out they were on their way to this congregation, where ‘competing’ birds are hung from a large frame and bets are placed on how many times they would tweet in a given timeframe. Seems to be the thing to do on a Sunday in this part of the world. 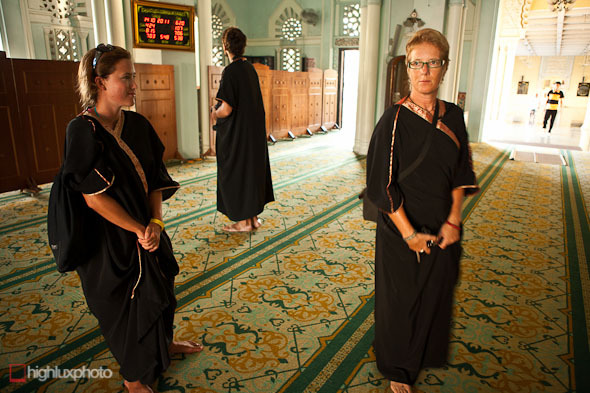 The further south we ride in Thailand the more muslim communities become. Headscarves and chadors are standard wear. 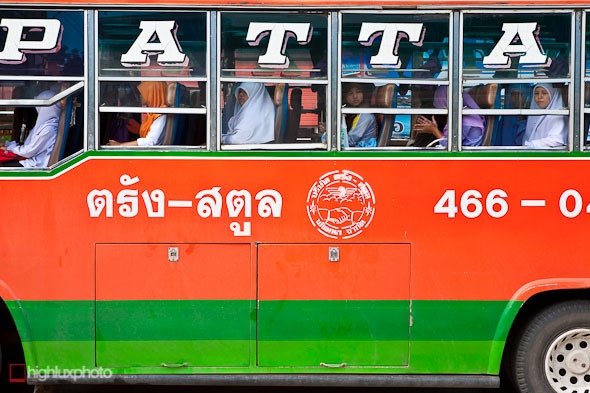 Final morning in Thailand as we head towards a border crossing that’s rarely used by tourists. 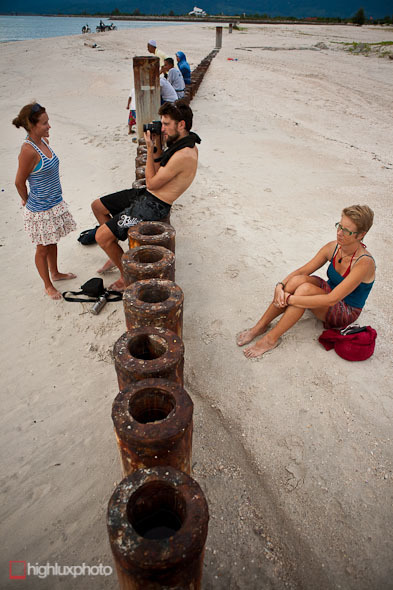 Apart from Krabi, since leaving Chumpon back on the east coast, we haven’t seen a single other white tourist. 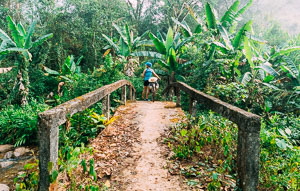 The border crossing is on the edge of a national park so we got to check out more jungle and 360 degree greenness. Quiet roads too. 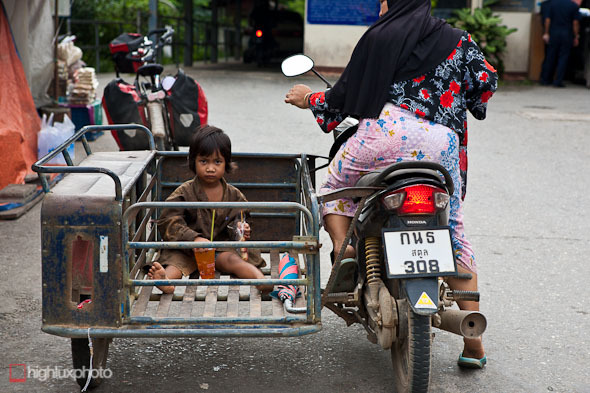 Curious: young kid at the border crossing. Bikes at the border. Border formalities were dealt with smoothly and soon we were on our way. Once inside Malaysia the island of Langkawi was calling us and later that same afternoon we got a ferry from Kuala Perlis out to the island, where we planned to hang out for a couple of days at Pantai Cenang. 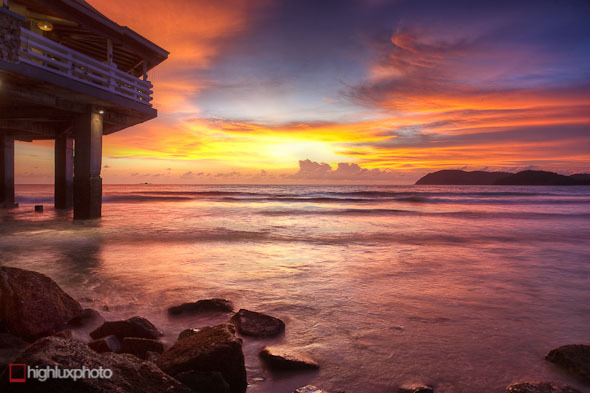 … and taking in some killa sunsets. Two days later we biked the 22km back to the ferry from Pantai Cenang beach and crossed back to the mainland to start riding south. Taking the coast road back to the ferry terminal on Langkawi. Nice and quiet and much more scenic than the main highway. 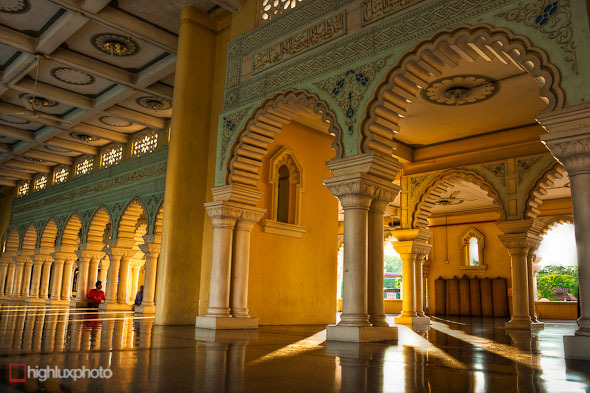 Mosque on Langkawi – the ‘Masjid al Hana’. 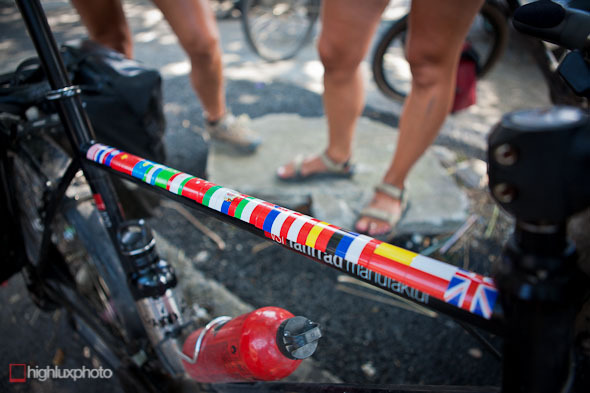 Ryan and Rebecca have racked up an impressive collection of national flag stickers after their 22-country epic. They’re the fastest sandal-wearing cyclists in the world too! 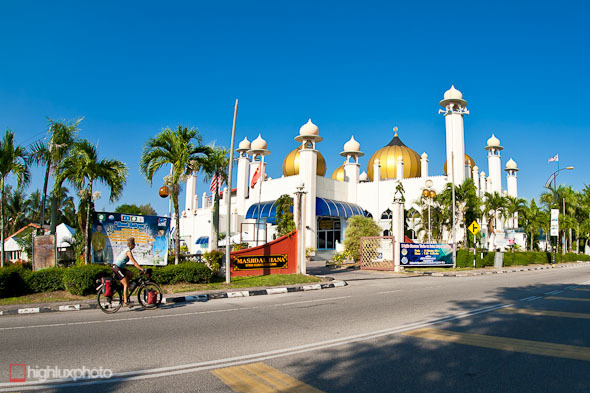 A fairly relaxed ride from Langkawi took us to Alor Star, site of the Masjid Al Nazir Mosque, one of the finest in Malaysia apparently. To top it off we got a sweet sunset to go with it. We had to wear some robes to cover our uncouth bare lower legs though. 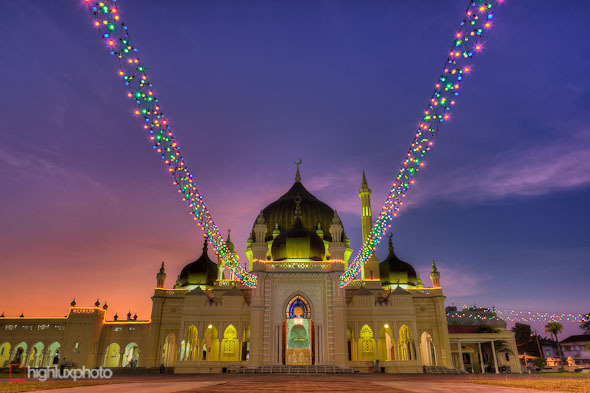 At 6pm the Call to Prayer was made over the town’s loudspeakers (an omnipresent background wail that you hear several times a day in these parts) and the mosque slowly filled with people. 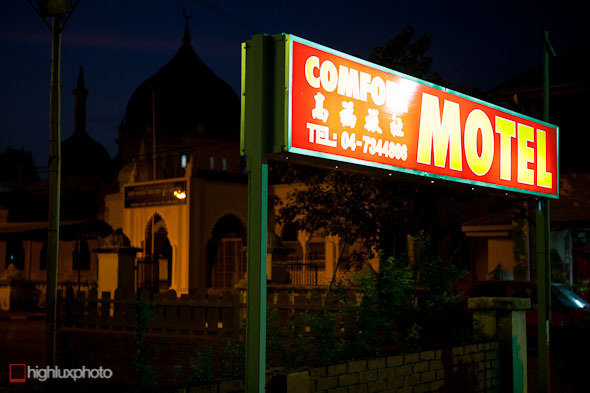 Comfort Motel: digs for the night, right opposite the mosque. 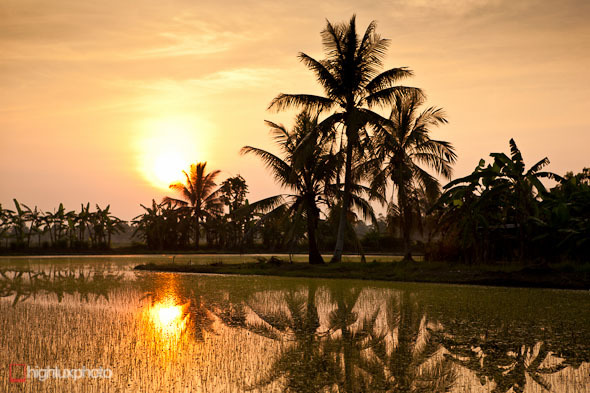 We were away from Alor Star before the sun rose (to beat the heat) and caught some awesome mornng light as we followed back roads through the rice paddies. Chatting to a local. People always want to know where we’re from and where we’re going. Questions concerning age, marital status and number of children usually follow soon after. 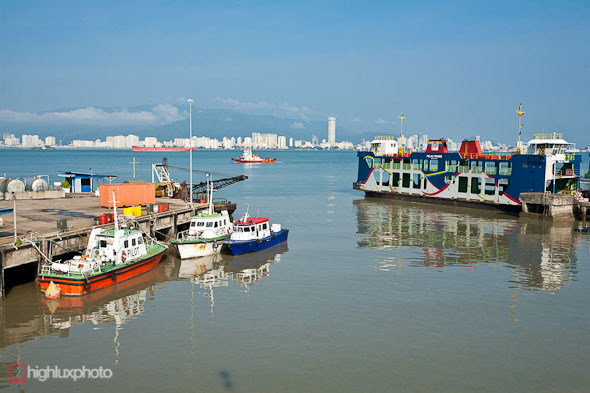 The day turned into a scorcher and after 117km we arrived in Butterworth and hopped on a ferry out to Gorgetown on Penang Island (background in the photo). 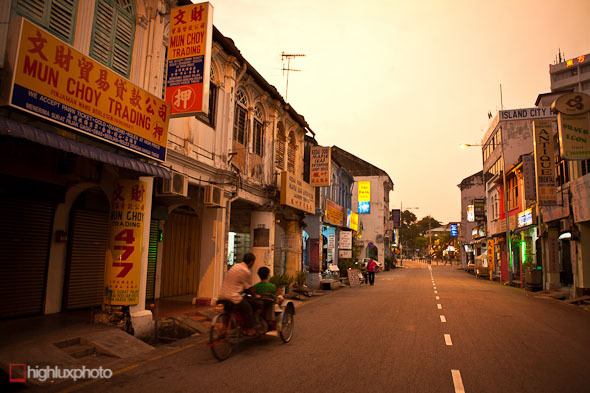 Georgetown has a very diverse and rich cultural history and we were keen to spend a day there checking it out. Butterworth, and indeed Georgetown itself were a huge contrast to the towns we’ve been riding through in Southern Thailand: highways, tall apartment blocks, and generally flasher infrastructure makes them appear a lot more western. Georgetown’s white apartments, office blocks and background hills rising above a shimmering sea reminded me of Acapulco. 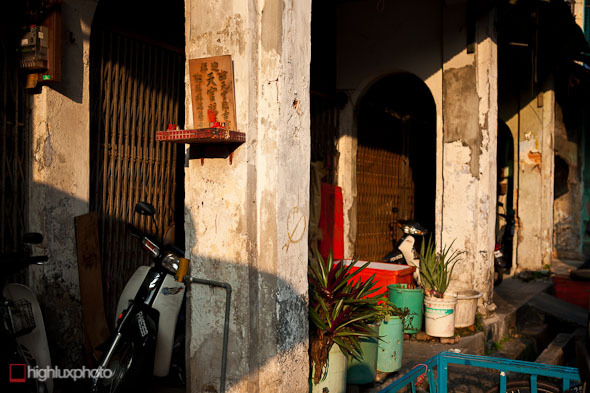 We stayed in Chinatown, just a short ride from the ferry and loved the immersion among old colonial buildings and shop houses, and the feverish activity of the Chinese and Indian markets. There’s a lot of seriously retro hotels to check out as well as other architectural curiosities. The orange haze, by the way, is caused by Indonesian fires and is an annual problem. It makes for spectacular sunsets, and terrible hayfever. Some of the locals are interesting too! The porticoed walkways and sturdy masonry reminded us of Mexico. Bike repairs in the guesthouse lobby. Mark, what a fantastic photo story! It’s great reading about our time with you from your perspective, and seeing some awesome shots. We wish you could have continued on with us!! Cheers – glad you liked it. Missing you guys! Been epic the past two days in Sumatra: 2100m climbing 2 days in a row! On the most incredibly steep roads. Tell you all about it later! Our legs are sooooo wrecked!